The family of the late Gerard & Margaret Slowey held a huge barbecue recently in Ardara to raise funds for Cancer Care West and two local charities: Ardara Resource Centre and Downstrands Womens Centre. Aine, Mairead and Anthony along with friends and neighbours presented one of the best barbecues ever and we all know Gerard would have been so proud of their efforts. In fact Grainne McGettigan Co-Ordinator for Cancer Care West in Donegal said that the amount raised this year was the biggest ever raised by a barbecue for Cancer Care West. Well done to all involved and we know next year will be just as good. 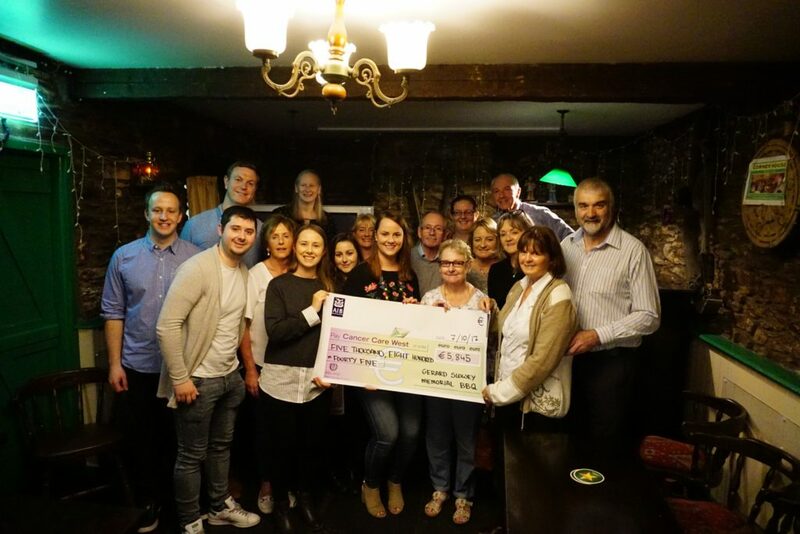 Cancer Care West was presented by Aine, Mairead, Anthony and friends with a cheque for €5,845 and Grainne McGettigan gladly accepted the cheque on behalf of Cancer Care West. Indeed, it was noted that Grainne attended the Barbecue this year and has done each year since Gerard decided to make the donation to Cancer Care West. The two local Charities will receive a donation of €700 each from the proceeds of the Barbecue.